This article is specific to small loans, often provided in a pooled manner. For direct payments to individuals for specific projects, see Micropatronage. For financial services to the poor, see Microfinance. For small payments, see Micropayment. Microcredit is the extension of very small loans (microloans) to impoverished borrowers who typically lack collateral, steady employment, or a verifiable credit history. It is designed to support entrepreneurship and alleviate poverty. Many recipients are illiterate, and therefore unable to complete paperwork required to get conventional loans. As of 2009 an estimated 74 million people held microloans that totaled US$38 billion. Grameen Bank reports that repayment success rates are between 95 and 98 percent. Microcredit is part of microfinance, which provides a wider range of financial services, especially savings accounts, to the poor. Modern microcredit is generally considered to have originated with the Grameen Bank founded in Bangladesh in 1983. Many traditional banks subsequently introduced microcredit despite initial misgivings. The United Nations declared 2005 the International Year of Microcredit. As of 2012, microcredit is widely used in developing countries and is presented as having "enormous potential as a tool for poverty alleviation." Microcredit is a tool that can be helpful to possibly reduce feminization of poverty in developing countries. However, a skeptical approach is advisable when assessing the effectiveness of microcredit. Critics argue that microcredit has not had a positive impact on gender relationships, does not alleviate poverty, has led many borrowers into a debt trap and constitutes a "privatization of welfare". The first randomized evaluation of microcredit, conducted by Esther Duflo and others, showed mixed results: there was no effect on household expenditure, gender equity, education or health, but the number of new businesses increased by one third compared to a control group. Ideas relating to microcredit can be found at various times in modern history, such as the Starr-Bowkett Society. Jonathan Swift inspired the Irish Loan Funds of the 18th and 19th centuries. In the mid-19th century, Individualist anarchist Lysander Spooner wrote about the benefits of numerous small loans for entrepreneurial activities to the poor as a way to alleviate poverty. At about the same time, but independently to Spooner, Friedrich Wilhelm Raiffeisen founded the first cooperative lending banks to support farmers in rural Germany. In the 1950s, Akhtar Hameed Khan began distributing group-oriented credit in East Pakistan. Khan used the Comilla Model, in which credit is distributed through community-based initiatives. The project failed due to the over-involvement of the Pakistani government, and the hierarchies created within communities as certain members began to exert more control over loans than others. Nobel laureate Muhammad Yunus, the founder of Grameen Bank, which is generally considered the first modern microcredit institution. The origins of microcredit in its current practical incarnation can be linked to several organizations founded in Bangladesh, especially the Grameen Bank. The Grameen Bank, which is generally considered the first modern microcredit institution, was founded in 1983 by Muhammad Yunus. Yunus began the project in a small town called Jobra, using his own money to deliver small loans at low-interest rates to the rural poor. Grameen Bank was followed by organizations such as BRAC in 1972 and ASA in 1978. Microcredit reached Latin America with the establishment of PRODEM in Bolivia in 1986; a bank that later transformed into the for-profit BancoSol. In Chile, BancoEstado Microempresas is the primary microcredit institution. Microcredit quickly became a popular tool for economic development, with hundreds of institutions emerging throughout the third world. Though the Grameen Bank was formed initially as a non-profit organization dependent upon government subsidies, it later became a corporate entity and was renamed Grameen II in 2002. Muhammad Yunus was awarded the Nobel Peace Prize in 2006 for his work providing microcredit services to the poor. Microcredit organizations were initially created as alternatives to the "loan-sharks" known to take advantage of clients. Indeed, many microlenders began as non-profit organizations and operated with government funds or private subsidies. By the 1980s, however the "financial systems approach," influenced by neoliberalism and propagated by the Harvard Institute for International Development, became the dominant ideology among microcredit organizations. The neoliberal model of microcredit can also be referred to as the institutionist model, which promotes applying market solutions as a viable way to address social problems. The commercialization of microcredit officially began in 1984 with the formation of Unit Desa (BRI-UD) within the Bank Rakyat Indonesia. Unit Desa offered ‘kupedes’ microloans based on market interest rates. Many microcredit organizations now function as independent banks. This has led to their charging higher interest rates on loans and placing more emphasis on savings programs. Notably, Unit Desa has charged in excess of 20 percent on small business loans. The application of neoliberal economics to microcredit has generated much debate among scholars and development practitioners, with some claiming that microcredit bank directors, such as Muhammad Yunus, apply the practices of loan sharks for their personal enrichment. Indeed, the academic debate foreshadowed a Wall-street style scandal involving the Mexican microcredit organization Compartamos. Even so, the numbers indicate that ethical microlending and investor profit can go hand-in-hand. In the 1990s a rural finance minister in Indonesia showed how Unit Desa could lower its rates by about 8% while still bringing attractive returns to investors. Though lending to groups has long been a key part of microcredit, microcredit initially began with the principle of lending to individuals. Despite the use of solidarity circles in 1970s Jobra, Grameen Bank and other early microcredit institutions initially focused on individual lending. (A solidarity circle is a group of borrowers that provide mutual encouragement, information, and assistance in times of need, though loans remain the responsibility of individuals.) Indeed, Muhammad Yunus propagated the notion that every person has the potential to become an entrepreneur. 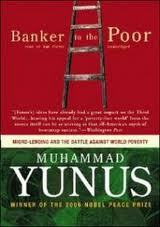 Yunus saw poverty eradication as being in the hands of the individual. Because of this, he promoted private ownership, and consequently, neoliberalism.The use of group-lending was motivated by economics of scale, as the costs associated with monitoring loans and enforcing repayment are significantly lower when credit is distributed to groups rather than individuals. Many times the loan to one participant in group-lending depends upon the successful repayment from another member, thus transferring repayment responsibility off of microcredit institutions to loan recipients. Lending to women has become an important principle in microcredit, with banks and NGOs such as BancoSol, WWB, and Pro Mujer catering to women exclusively. Pro Mujer also implemented a new strategy to combine microcredits with health-care services, since the health of their clients is crucial to the success of microcredits. Though Grameen Bank initially tried to lend to both men and women at equal rates, women presently make up ninety-five percent of the bank’s clients. Women continue to make up seventy-five percent of all microcredit recipients worldwide. Exclusive lending to women began in the 1980s when Grameen Bank found that women have higher repayment rates, and tend to accept smaller loans than men. Mumbai Headquarters of the National Bank for Agriculture and Rural Development of India, which on-lends funds to banks providing microcredit. Grameen Bank in Bangladesh is the oldest and probably best-known microfinance institution in the world. Grameen Bank launched their US operations in New York in April 2008. Bank of America has announced plans to award more than $3.7 million in grants to nonprofits to use in backing microloan programs. The Accion U.S. Network, the US subsidiary of the better-known Accion International, has provided over $450 million in microloans since 1991, with an over 90% repayment rate. One research study of the Grameen model shows that poorer individuals are safer borrowers because they place more value on the relationship with the bank. Even so, efforts to replicate Grameen-style solidarity lending in developed countries have generally not succeeded. For example, the Calmeadow Foundation tested an analogous peer-lending model in three locations in Canada during the 1990s. It concluded that a variety of factors — including difficulties in reaching the target market, the high risk profile of clients, their general distaste for the joint liability requirement, and high overhead costs — made solidarity lending unviable without subsidies. Microcredits have also been introduced in Israel, Russia, Ukraine and other nations where micro-loans help small business entrepreneurs overcome cultural barriers in the mainstream business society. The Israel Free Loan Association (IFLA) has lent more than $100 million in the past two decades to Israeli citizens of all backgrounds. In India, the National Bank for Agriculture and Rural Development (NABARD) finances more than 500 banks that on-lend funds to self-help groups (SHGs). SHGs comprise twenty or fewer members, of whom the majority are women from the poorest castes and tribes. Members save small amounts of money, as little as a few rupees a month in a group fund. Members may borrow from the group fund for a variety of purposes ranging from household emergencies to school fees. As SHGs prove capable of managing their funds well, they may borrow from a local bank to invest in small business or farm activities. Banks typically lend up to four rupees for every rupee in the group fund. In Asia borrowers generally pay interest rates that range from 30% to 70% without commission and fees. Nearly 1.4 million SHGs comprising approximately 20 million women now borrow from banks, which makes the Indian SHG-Bank Linkage model the largest microfinance program in the world. Similar programs are evolving in Africa and Southeast Asia with the assistance of organizations like IFAD, Opportunity International, Catholic Relief Services, Compassion International, CARE, APMAS, Oxfam, Tearfund and World Vision. The principles of microcredit have also been applied in attempting to address several non-poverty-related issues. Among these, multiple Internet-based organizations have developed platforms that facilitate a modified form of peer-to-peer lending where a loan is not made in the form of a single, direct loan, but as the aggregation of a number of smaller loans—often at a negligible interest rate. Examples of platforms that connect lenders to micro-entrepreneurs via Internet are Kiva, Zidisha, and the Microloan Foundation. Another WWW-based microlender, United Prosperity, uses a variation on the usual microlending model; with United Prosperity the micro-lender provides a guarantee to a local bank which then lends back double that amount to the micro-entrepreneur. United Prosperity claims this provides both greater leverage and allows the micro-entrepreneur to develop a credit history with their local bank for future loans. In 2009, the US-based nonprofit Zidisha became the first peer-to-peer microlending platform to link lenders and borrowers directly across international borders without local intermediaries. Vittana allows peer-to-peer lending for student loans in developing countries. The impact of microcredit is a subject of much controversy. Proponents state that it reduces poverty through higher employment and higher incomes. This is expected to lead to improved nutrition and improved education of the borrowers' children. Some argue that microcredit empowers women. In the US, UK and Canada, it is argued that microcredit helps recipients to graduate from welfare programs. Critics say that microcredit has not increased incomes, but has driven poor households into a debt trap, in some cases even leading to suicide. They add that the money from loans is often used for durable consumer goods or consumption instead of being used for productive investments, that it fails to empower women, and that it has not improved health or education. The available evidence indicates that in many cases microcredit has facilitated the creation and the growth of businesses. It has often generated self-employment, but it has not necessarily increased incomes after interest payments. In some cases it has driven borrowers into debt traps. There is no evidence that microcredit has empowered women. In short, microcredit has achieved much less than what its proponents said it would achieve, but its negative impacts have not been as drastic as some critics have argued. Microcredit is just one factor influencing the success of a small businesses, whose success is influenced to a much larger extent by how much an economy or a particular market grows. Many scholars and practitioners suggest an integrated package of services ('a credit-plus' approach) rather than just providing credits. When access to credit is combined with savings facilities, non-productive loan facilities, insurance, enterprise development (production-oriented and management training, marketing support) and welfare-related services (literacy and health services, gender and social awareness training), the adverse effects discussed above can be diminished. Some argue that more experienced entrepreneurs who are getting loans should be qualified for bigger loans to ensure the success of the program. One of the principal challenges of microcredit is providing small loans at an affordable cost. The global average interest and fee rate is estimated at 37%, with rates reaching as high as 70% in some markets. The reason for the high interest rates is not primarily cost of capital. Indeed, the local microfinance organizations that receive zero-interest loan capital from the online microlending platform Kiva charge average interest and fee rates of 35.21%. Rather, the principal reason for the high cost of microcredit loans is the high transaction cost of traditional microfinance operations relative to loan size. Microcredit practitioners have long argued that such high interest rates are simply unavoidable. The result is that the traditional approach to microcredit has made only limited progress in resolving the problem it purports to address: that the world's poorest people pay the world's highest cost for small business growth capital. The high costs of traditional microcredit loans limit their effectiveness as a poverty-fighting tool. Borrowers who do not manage to earn a rate of return at least equal to the interest rate may actually end up poorer as a result of accepting the loans. According to a recent survey of microfinance borrowers in Ghana published by the Center for Financial Inclusion, more than one-third of borrowers surveyed reported struggling to repay their loans. In recent years, microcredit providers have shifted their focus from the objective of increasing the volume of lending capital available, to address the challenge of providing microfinance loans more affordably. Analyst David Roodman contends that in mature markets, the average interest and fee rates charged by microfinance institutions tend to fall over time. Professor Dean Karlan from Yale University advocates also giving the poor access to savings accounts. ^ "Kiva Is Not Quite What It Seems". ^ a b c d e f g h i Bateman, Milford (2010). Why Doesn't Microfinance Work?. Zed Books. ^ Jason Cons and Kasia Paprocki of the Goldin Institute, "The Limits of Microcredit—A Bangladeshi Case" Archived 2012-01-16 at the Wayback Machine, Food First Backgrounder (Institute for Food and Development Policy), Winter 2008, volume 14, number 4. ^ Arp, Frithjof (12 January 2018). "The 34 billion dollar question: Is microfinance the answer to poverty?". Global Agenda. World Economic Forum. ^ Banerjee, Abhijit; Esther Duflo; Rachel Glennester; Cynthia Kinnan. "The miracle of microfinance? Evidence from a randomized evaluation". Retrieved 17 April 2012. ^ Aidan Hollis; Arthur Sweetman (March 1997). "Complementarity, Competition and Institutional Development: The Irish Loan Funds through Three Centuries" (PDF). Retrieved 30 January 2012. ^ Spooner, Lysander (1846). "Poverty: Its illegal causes and legal cure". Boston. Archived from the original on 25 October 2012. Retrieved 30 January 2012. ^ a b c d Drake, Deborah (2002). The Commercialization of Microfinance. Kumarian. ^ a b c d e f Armendariz, Beatriz (2005). The Economics of Microfinance. Cambridge, Mass: The MIT Press. ^ de la Torre, Augusto; Gozzi, Juan Carlos; Schmukler, Sergio L. (2017). "Microfinance: BancoEstado's Experience in Chile". Innovative Experiences in Access to Finance: Market-Friendly Roles for the Visible Hand?. pp. 221–251. ^ Bisen, Arjun; Dalton, Bronwen; Wilson, Rachel (November 2012). "The Social Construction of the Microfinance Industry: a comparison of donor and recipient perspectives". Cosmopolitan Civil Societies: An Interdisciplinary Journal. 4. ^ a b "BRI-Unit Desa, Indonesia". ^ Minilening uitleg. "Wat is een minilening ?". Minilening (in Dutch). Retrieved 16 December 2016. ^ "Bank of America Issues Grants for Microloans". Wall Street Journal. October 6, 2010. Retrieved 30 January 2012. ^ "U.S. Network". 5 June 2014. Archived from the original on 2018-02-22. Retrieved 2015-05-19. ^ Cheryl Frankiewicz. "Calmeadow Metrofund: A Canadian Experiment in Sustainable Microfinance", Calmeadow Foundation, April 2001. ^ Dewan, Shaila. "Microcredit for Americans". nytimes.com. ^ "Can Microcredit Work in the United States?". hbr.org. 1 November 1999. ^ Bayrasli, Elmira. "Microfinance in America?". forbes.com. ^ Nitin Bhatt, Gary Painter, and Shui-Yan Tang, 1999. “Can Microcredit Work in the United States?”, Harvard Business Review, November-December 1999 Issue. Retrieved March 06, 2018, from https://hbr.org/1999/11/can-microcredit-work-in-the-united-states - "U.S. microcredit programs have helped many poor but ambitious borrowers to improve their lot. The Aspen Institute’s study of 405 microentrepreneurs indicates that more than half of the loan recipients escaped poverty within five years. On average, their household assets grew by nearly $16,000 during that period; the group’s reliance on public assistance dropped by more than 60%." ^ Tonelli M. and C. Dalglish, 2012. “Micro-Credit is Necessary but Not Sufficient for Entrepreneurs in Desperate Poverty”, FSR Forum, Vo.14, Issue 4 (p.16-21). ISSN 1389-0913 Retrieved July 12, 2012, from https://jeffersonal.issuu.com/secretarisfsr/docs/fsr_forum_14-04_lr/18[permanent dead link] - "U.S. microcredit programs have helped many poor but ambitious borrowers to improve their lot. The Aspen Institute’s study of 405 microentrepreneurs indicates that more than half of the loan recipients escaped poverty within five years. On average, their household assets grew by nearly $16,000 during that period; the group’s reliance on public assistance dropped by more than 60%." ^ "Microcredit doesn't live up to promise of transforming lives of the poor, 6 studies show". EurekAlert!. ^ Holvoet, Nathalie. "The Impact of Microfinance on Decision-Making Agency: Evidence from South India". ^ McFarquhar, Neil (April 13, 2010). "Banks Making Big Profits From Tiny Loans". New York Times. ^ "Kiva Help - Interest Rate Comparison". Kiva.org. Archived from the original on August 3, 2009. Retrieved October 10, 2009. ^ "How Kiva works - Kiva". ^ "Microfinance: Do the micro-loans contribute to the well-being of the people or do they leave them even poorer due to high interest rates? - Quora". Following is a selected bibliography about microcredit. Adams, Dale, Doug Graham and J.D. Von Pischke (eds.). Undermining Rural Development with Cheap Credit. Westview Press, Boulder, Colorado, 1984. Bateman, Milford. 'Why Doesn't Microfinance Work? The Destructive Rise of Local Neoliberalism'. Zed Books, London, 2010. Drake, Deborah, and Elizabeth Rhyne (eds.). The Commercialization of Microfinance: Balancing Business and Development. Kumarian Press, 2002. Rhyne, Elizabeth. Mainstreaming Microfinance: How Lending to the Poor Began, Grew and Came of Age in Bolivia. Kumarian Press, 2001. Fuglesang, Andreas and Dale Chandler. Participation as Process – Process as Growth – What We can Learn from the Grameen Bank. Grameen Trust, Dhaka, 1993. Gibbons, David. The Grameen Reader. Grameen Bank, Dhaka, 1992. Harper, Malcolm and Shailendra Vyakarnam. Rural Enterprise: Case Studies from Developing Countries. ITDG Publishing, 1988. Hulme, David and Paul Mosley. Finance Against Poverty. Routledge, London, 1996. Johnson, Susan and Ben Rogaly. Microfinance and Poverty Reduction. Oxfam, Oxford UK, 1997. Kadaras, James & Elizabeth Rhyne. Characteristics of equity investment in microfinance. Accion International, 2004. Khandker, Shahidur R. Fighting Poverty with Microcredit. Bangladesh edition, The University Press Ltd, Dhaka, 1999. Rutherford, Stuart. ASA: The Biography of an NGO, Empowerment and Credit in Rural Bangladesh. ASA, Dhaka, 1995. Small Enterprise Development. Intermediate Technology Publications, London. Wood, Geoff D. & I. Sharif (eds.). Who Needs Credit? Poverty and Finance in Bangladesh. University Press Ltd., Dhaka, 1997. Yunus Muhammad, Moingeon Bertrand & Laurence Lehmann-Ortega, "Building Social Business Models: Lessons from the Grameen Experience", April-June, vol 43, n° 2-3, Long Range Planning, 2010, p. 308-325"
Yunus, Muhammad. Banker to the Poor: Micro-Lending and the Battle Against World Poverty. Public Affairs, 2003. Padmanabahn, K.P., Rural Credit, Intermediate Tech. Publ. Ltd., London 1988. Germidis D. et al.,Financial Systems and Development: what role for the formal and informal financial sectors?, OECD, Paris 1991. Robinson, Marguerite S., The microfinance revolution, The World Bank, Washington D.C., 2001. Mauri, Arnaldo, (1995): A new approach to institutional lending and loan administration in rural areas of LDCs, International Review of Economics, ISSN 1865-1704, Vol. 45, no. 4, pp. 707–716. Goetz, A.-M.; Sengupta, R. (1996). "Who Takes the Credit? Gender, Power and Control over Loan Use in Rural Credit Programmes in Bangladesh". World Development. 24: 45–63. doi:10.1016/0305-750x(95)00124-u. Johnson, S. 1997. Gender and Micro-finance: guidelines for best practice. Action Aid-UK. Kabeer, N. 1998. 'Money Can't Buy Me Love'? Re-evaluating Gender, Credit and Empowerment in Rural Bangladesh. IDS Discussion Paper 363. Mayoux, L. 1998a. Women's Empowerment and Micro-finance programmes: Approaches, Evidence and Ways Forward. The Open University Working Paper No 41. Rahman, A (1999). "Micro-credit Initiatives for Equitable and Sustainable Development: Who Pays?". World Development. 27 (1): 67–82. doi:10.1016/s0305-750x(98)00105-3. CHESTON, S. and KUHN, L. (2002). Empowering Women through Microfinance. Pathways Out of Poverty: Innovations in Microfinance for the Poorest Families. Harper, A. ( 1995). Providing women in Baltistan with access to loans – potential and problems. Lahore, AKRSP Pakistan. Mutalima, I. K., 2006, Microfinance and Gender Equality: Are We Getting There? : Micro Credit Summit, Halifa, Royal Tropical Institute and Oxfam Novib. Muhammad Yunus is a Bangladeshi social entrepreneur, banker, economist, and civil society leader who was awarded the Nobel Peace Prize for founding the Grameen Bank and pioneering the concepts of microcredit and microfinance. These loans are given to entrepreneurs too poor to qualify for traditional bank loans. In 2006, Yunus and the Grameen Bank were jointly awarded the Nobel Peace Prize "for their efforts through microcredit to create economic and social development from below". The Norwegian Nobel Committee said that "lasting peace cannot be achieved unless large population groups find ways in which to break out of poverty" and that "across cultures and civilizations, Yunus and Grameen Bank have shown that even the poorest of the poor can work to bring about their own development". Yunus has received several other national and international honours. He received the United States Presidential Medal of Freedom in 2009 and the Congressional Gold Medal in 2010. Kiva Microfunds is a 501(c)(3) non-profit organization that allows people to lend money via the Internet to low-income entrepreneurs and students in over 80 countries. Kiva's mission is "to connect people through lending to alleviate poverty." LAPO is a Nigerian organisation with a Microfinance Bank (MFB) dedicated to self-employment through microfinance and an NGO, a non-governmental, non-profit community development organization focused on the empowerment of the poor and the vulnerable. The institution was founded as a non-profit entity by Mr. Godwin Ehigiamusoe while working as a rural co-operative officer in Delta State, Nigeria. LAPO started its activities in 1987 and was formally incorporated as a nonprofit nongovernmental organization (NGO) in 1993. In Nigeria, LAPO has partnered with the Grameen Bank. In 2010, LAPO transformed it's Microfinance activities into a regulated microfinance bank, while the remaining activities continued under the LAPO NGO. Microcredit for water supply and sanitation is the application of microcredit to provide loans to small enterprises and households in order to increase access to an improved water source and sanitation in developing countries. While most investments in water supply and sanitation infrastructure are financed by the public sector, investment levels have been insufficient to achieve universal access. Commercial credit to public utilities was limited by low tariffs and insufficient cost-recovery. Microcredits are a complementary or alternative approach to allow the poor to gain access to water supply and sanitation. Compartamos Banco is a Mexican bank and the largest microfinance bank in Latin America, serving more than 2.5 million clients. The bank was founded in 1990 and is headquartered in Mexico City. Kashf Foundation is a non-profit, microfinance and wealth management organization, founded by Roshaneh Zafar in 1996. Kashf is regarded as the first microfinance institution (MFI) of Pakistan that uses village banking methodology in microcredit to alleviate poverty by providing affordable financial and non-financial services to low income households - particularly for women, to build their capacity and enhance their economic role. With headquarters in Lahore, Punjab, Kashf has regional offices in five major cities and over 200 branches across the Pakistan.